Adopted on March 16, 1931. The Saguaro Blossom, (Carnegiea gigantea,) was adopted as the floral emblem of the Arizona Territory on March 8, 1901, and officially confirmed as the state flower by the Legislature on March 16, 1931. Prior to its adoption, a saguaro cactus appeared on the first territorial seal of Arizona in 1863.The giant saguaro cactus (Cereus giganteus) is indigenous to Arizona; it grows to a height of forty to fifty feet and lives to an age of 150 to 200 years. The blossom of the tree-sized saguaro cactus is a distinctive desert flower, fragrant and creamy white with a yellow center. The saguaro cactus (Carnegiea gigantea) is one of the defining plants of the Sonoran Desert. The saguaro cactus has been described as the monarch of the Sonoran Desert, as a prickly horror, as the supreme symbol of the American Southwest, and as a plant with personality. The Saguaro is renowned for the variety of odd, all-too-human shapes it assumes, shapes that inspire wild and fanciful imaginings. These plants are large, tree-like columnar cacti that develop branches (or arms) as they age, although some never grow arms. These arms generally bend upward and can number over 25. 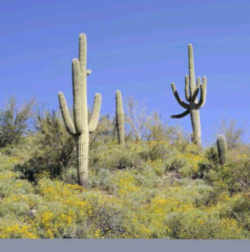 Saguaros are covered with protective spines, white flowers in the late spring, and red fruit in summer. 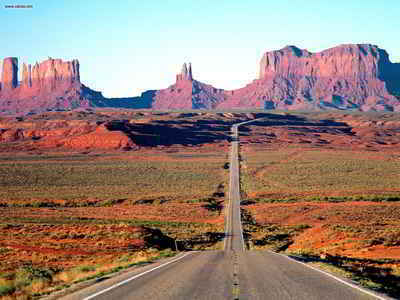 The Saguaro is a relatively fast growing cactus Also known, as Saguaro is the most famous giant cactus of the world. Can grow up to 12 M height. Saguaro wine is used for rain rituals. The pulp can be boiled down or fermented, witch gives you sweet, brown syrup. This can be mixed with water or alcohol, which gives you Saguaro beer or wine. The fragrant, waxy white saguaro blossom is one of the most unique State flowers. 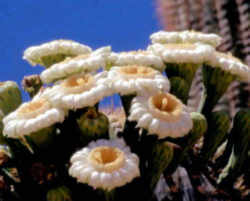 In May and June, the Cactus bears creamy white flowers with yellow centers that measured about three inches. The Saguaro Cactus flower can be found on the end of the branches. The flower only opens on cooler nights and is closed during the heat of midday. However, it's not easy to see the beautiful, creamy white, trumpet-shaped flowers inasmuch as they open only at night and last only about 18 hours. 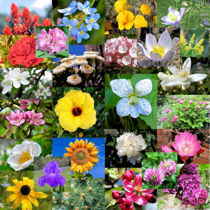 The flowers are sweetly scented and attract bees and flies through its blooming season of May and June. By July, the flowers become red-fleshed fruits that feed doves migrating from Mexico. 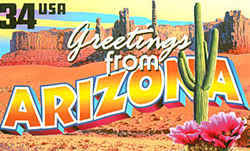 Saguaros are found exclusively in the Sonoran Desert. The most important factors for growth are water and temperature. If the elevation is too high, the cold weather and frost can kill the saguaro. Although the the Sonoran Desert experiences both winter and summer rains, it is thought that the Saguaro obtains most of its moisture during the summer rainy season. The giant saguaro is the king of cacti. A full-grown saguaro is usually more than 35 feet in height and is at least 75 years old, sometimes reaching a height of 50 feet and life span of 200 years. Some have arms but all are green and have a wax-like skin that helps prevent water loss. Rare and endangered this extraordinary giant cactus has been protected within Saguaro National Park since 1933. Saguaro are very slow growing cactus. A 10 year old plant might only be 1.5 inches tall. Saguaro can grow to be between 40-60 feet tall (12-18m). When rain is plentiful and the saguaro is fully hydrated it can weigh between 3200-4800 pounds. You find this cactus in southern Arizona and western Sonora, Mexico. At the northern portion of their range they are more plentiful on the warmer south facing slopes. A few stray plants can also be found in southeast California. The saguaro fruit has long been used by the Papago and Pima Indians who harvest the fruits and make syrup. Saguaro seeds contain the psychoactive alkaloids Carnegine and Arizonine. The law designating the Saguaro as the official Arizona state flower is found in the Arizona Revised Statutes, Title 41, Chapter 4.1, Article 5, Section 41-855. CHAPTER 4.1. HISTORY, ARCHAEOLOGY AND STATE EMBLEMS. The pure white waxy flower of the Cereus giganteus (giant cactus) or Saguaro shall be the state flower.